Can machine learning deliver AI? Theoretical results, inspiration from the brain and cognition, as well as machine learning experiments suggest that in order to learn the kind of complicated functions that can represent high-level abstractions (e.g. in vision, language, and other AI-level tasks), one would need deep architectures. 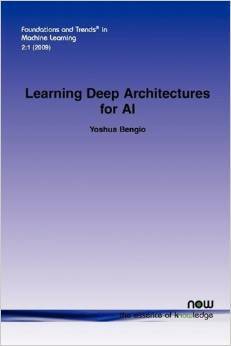 Deep architectures are composed of multiple levels of non-linear operations, such as in neural nets with many hidden layers, graphical models with many levels of latent variables, or in complicated propositional formulae re-using many sub-formulae. Each level of the architecture represents features at a different level of abstraction, defined as a composition of lower-level features. Searching the parameter space of deep architectures is a difficult task, but new algorithms have been discovered and a new sub-area has emerged in the machine learning community since 2006, following these discoveries. Learning algorithms such as those for Deep Belief Networks and other related unsupervised learning algorithms have recently been proposed to train deep architectures, yielding exciting results and beating the state-of-the-art in certain areas. Learning Deep Architectures for AI discusses the motivations for and principles of learning algorithms for deep architectures. By analyzing and comparing recent results with different learning algorithms for deep architectures, explanations for their success are proposed and discussed, highlighting challenges and suggesting avenues for future explorations in this area. Yoshua Bengio is Full Professor of the Department of Computer Science and Operations Research, head of the Machine Learning Laboratory (MILA), CIFAR Program co-director of the CIFAR Neural Computation and Adaptive Perception program, Canada Research Chair in Statistical Learning Algorithms, and he also holds the NSERC-Ubisoft industrial chair. His main research ambition is to understand principles of learning that yield intelligence.